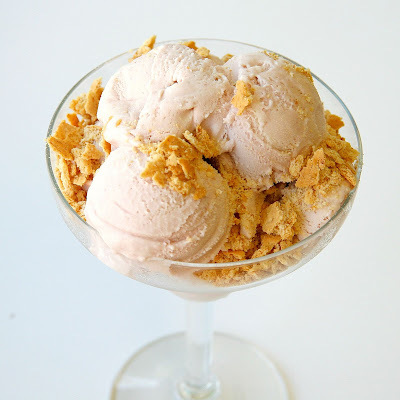 This ice cream is so delicious and yet soooo easy! My darling friend at work told me the best/simplest way to make cheesecake ice cream and I just had to try it out. Adding the graham crackers on top and mixing a few in really made this ice cream taste like it is from an expensive ice cream shop. This basic ice cream is so versatile you could add just about any flavor that would go well with cheesecake! I love any recipe that I can change just slightly to fit my mood for that day. This is the perfect summer treat especially with some fresh raspberries in it! In a blender or food processor puree raspberries. If you don't like seeds strain puree mixture through a fine mesh strainer. In a large mixing bowl whisk together milk, cream, sugar, vanilla, pudding mix, and raspberry puree. Freeze in ice cream maker according to manufacturer's directions﻿. After frozen you can serve immediately or freeze for a few hours for a more solid ice cream. When serving crumble some graham crackers over mixture and mix in slightly. Enjoy! Cheesecake pudding....what a great idea. This looks fabulous. I tried this last week and my daughter loved it so much. Thanks.